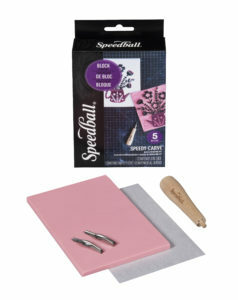 Whether you’re new to block printing or a seasoned pro, Speedball’s Block Printing Kits make for a simple and convenient way to stock up on your block printing supplies. Featuring a selection of our most popular block printing materials, Speedball has the kit to match your printing project’s, classroom’s or studio’s needs perfectly! Select from the drop down menu below to learn more about each of these great products. This is the ideal kit for the beginner. Featuring all the essentials to get stared in block printing, the Super Value Block Printing Starter Kit contains (1) each of the following: 1.25oz. Water-Soluble Block Printing Ink (Black); 4” Pop-In Soft Rubber Brayer; Lino Handle (Red); #1, #2, and #5 Lino Cutters; 4”x6” Speedy-Carve™ Block and Block Printing Instruction Booklet. 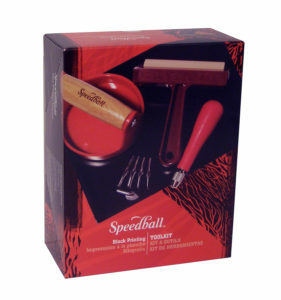 Perfect for relief printers and stampers alike, the Speedball Speedy-Carve Kit includes (1)ea. of the following: Wooden Lino Handle, #2 & #4 Lino Cutters, 4" x 6" Speedy-Carve Block, tracing paper and instructional booklet. Designed with the true block printing enthusiast in mind, this kit includes (1) each of the following: 2.5oz. Water-Soluble Block Printing Ink (Black); 1.25oz. Water-Soluble Block Printing Ink (Red, Yellow, Blue); 1.25oz. Water-Soluble Block Printing Extender; 4” Pop-In Soft Rubber Brayer; Bench Hook/Inking Plate; Lino Handle (Red); #1, #2, #5 and #6 Lino Cutters; 4”x5” Mounted Linoleum Block; 4”x6” Speedy-Carve Block and Block Printing Instruction Booklet. Containing everything needed to create beautiful block prints on fabric, the Speedball Ultimate Fabric Block Printing Kit features (1) each of the following: 1.25oz. Fabric Block Printing Ink (Black, White); 4” Pop-In Soft Rubber Brayer; Bench Hook/Inking Plate; Lino Handle (Red); #1, #2, #3 and #5 Lino Cutters, 4”x5” Mounted Linoleum Block; 3”x4” Speedy-Carve Block; Red Baron™ Baren; 1oz. Pink Soap™; Instructional DVD and Booklet. Also includes (5) sheets of printing paper for test prints. Already all stocked up on your favorite Speedball Block Printing Inks? Then the Tool Kit is made just for you! 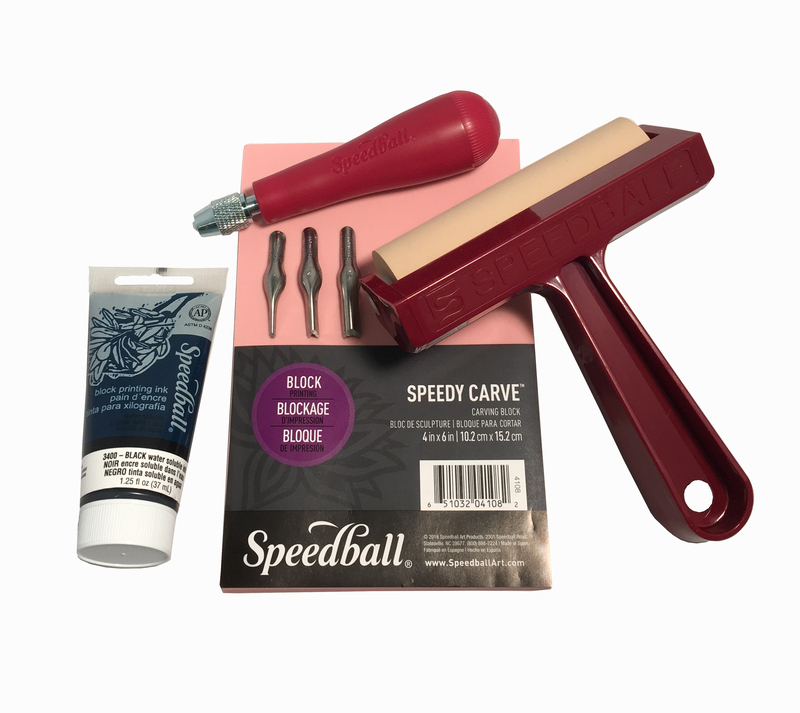 Containing all the essential block printing tools, the Speedball Block Printing Tool Kit includes (1) each of the following: 4” Pop-In Soft Rubber Brayer; Bench Hook/Inking Plate; Lino Handle (Red); #1, #2, #3, #5 and #6 Lino Cutters; Red Baron Baren.